In recent years, the name of the Spaniard John Lakveet has become a household name in electronic music. As opposed to a lot of his colleagues in the field of retro-EM, he doesn’t produce ultra-long pieces of music with long intros but he manages to tell his story in quite a short time. This short time also applies to his musical outlet. His latest album "The Force Of Reason" was released less than a year ago. But, if artists are able to create interesting and innovative music, that is not a problem. And with John, this is certainly the case. Sequences are John’s speciality, pulsating and hypnotising. The sequencing on "Proportions" is great; he is really an absolute master in creating the right sequences. Just listen to the multi-sequences in the opening track "Fractal Clouds" and this becomes clear. It is not all sequences on the album: John is also very capable in adding interesting ambient sounds to his music, like in "Randomize Fractions". The melodies on the album are also beautiful. Just listen to "Confusion Of Integral". Perhaps the best sequences on the cd can be heard on "Elipse O" and "Awakes Disorder". "Square Serial" is a collaboration with his fellow countryman Dom F. Scab. It’s a great melodical track with easy rhythms and a fine overall atmosphere. These gentlemen know what they are doing. John Lakveet produces unique music of great beauty and warmth. With his approach it is well possible for him to manage a breakthrough into the top of EM. With "Proportions" he has made another step in this direction. 2005. Press Information "Fractal Clouds" starts Proportions with booming sounds like distant thunder. Twittering electronics appear on top of a bed of atmospheric synths. After a couple of minutes, Lakveet’s trademark crisp sequencing comes brightly to the fore. Then a simple synth lead brings in a sparse melody so as not to detract from the already busy background effects. Sequencer fanatics will really be in heaven on this one as it is continuously in motion, gyrating and shifting constantly. After nearly 10 minutes it finally relaxes for a spell, going back to its thunderous and ambient textural origins. The last note hangs in the air, flowing into "Randomize Fractions", a mellow reprise of the first track, or a distant inverted echo of it. "Confusion of Integral" has a cute Vangelis-like melody as softly clanging electronics loop in and out of the mix. This one wavers quite a bit in a quirky manner, playing with the pitch bend. Sequencing comes back full throttle in "Elipse ,", moving at an almost frenetic clip. Similar but better is "1 and 1 and", which is equally rapid but more hypnotic than frantic. Perhaps best of the bunch is "Square Serial", composed with frequent collaborator Dom F. Scab. It has a number of different themes to keep things interesting. At its heart, Proportions is extremely computer based, right down to the fractal graphics on the cover. Despite its often playful nature, it has a certain cold precision to it. If you are looking for pure synthetic sound, look no further. 2005. Phil Derby / Electroambient Space John Lakveet has released such an extraordinary album that it cannot leave any listener unconcerned. The record, entirely composed by John except for one of the themes, "Square Serial", written by himself and Dom F. Scab, is a journey through fascinating sonic worlds, that appear to have been taken out of a distant future. The cosmic style present in the melodies is symphonic, often with spectacular orchestrations with synthesizers and a certain romantic character though it doesn't fall into an excessive sweetness. The artist creates complex rhythmic structures, that become perfectly fused with the melodies and the atmospheres. He utilizes electronics with great imagination, succeeding in creating unconventional sonic architectures. 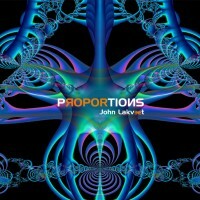 "Proportions" shows that electronic music has not abandoned the originality that characterized it in the beginning. No doubt this cd will appeal to the fans of John Lakveet's music as well as the lovers of Space Music in general. Edgar Kogler / Spain This CD from 2005 offers 73 minutes of thought-provoking electronic music. Lakveet is joined on one track by Dom F. Scab. Ron Boots mastered the entire release. Nimble-fingered keys contribute complex riffs to a lush foundation of pulsating electronic textures. Auxiliary harmonics add even more body to the sprightly tuneage, resulting in extremely busy structures that oscillate and throb with engaging temperament. Even when pursuing sparser configurations, the music carries a subtle density, often utilizing airy passages that convey a distinct weight and deliberate presence. Chords flow forth with measured velocity. While cycles are generated, additional patterns seep in from the sidelines to embellish the mix like spicy seasoning. A blend of sparkling resonance and almost growling notes succeed in producing a lush sonic palette that bestows a satisfying range to the songs. Percussion is relatively absent from this music. The pieces rely mostly on rapid succession of strident electronic sounds to provide a rhythmic propulsion. A moodiness permeates this music, buried beneath lively chords and surging tonalities. Whether resulting from pensive attitudes or just cerebral intents, the compositions exhibit a scientific demeanor, carefully arranged and directed to stimulate cognitive processes with their peppy delivery. Matt Howarth / Sonic Curiosity The Spaniard John Lakveet has, little by little, become a household name in electronic (retro-)music. Unlike a lot of his colleagues, he doesn't produce ultra-long pieces of music with long intros but instead he manages to tell his story in quite a short time. Speaking of time: this also relates to his musical output. His latest album "The Force Of Reason" was released less than a year ago. But, if one is able to create interesting and innovative music, that is not a problem. And with John, such is certainly the case. Sequences are John’s speciality, they are pulsating and hypnotizing. Jon is really a master at this. Just listen to the multi-sequences in the opening track "Fractal Clouds" and this fact also becomes clear on "Elipse O" and "Awakes Disorder". It is not all sequences on the album, though. John is also very capable at adding interesting ambient sounds to his music, as in "Randomize Fractions". The melodies on the album are likewise beautiful, for instance "Confusion Of Integral" and "Square Serial", a collaboration with his fellow countryman Dom F. Scab. It is a great track with easy rhythms and a fine overall atmosphere. These gentlemen know what they are doing. Lakveet releases a lot of music but the quality remains okay and that is the most important thing. Paul Rijkens / SonicImmersion.org Son précédent opus, The Force of Reason (PR 41), l’avait laissé entrevoir, John LAKVEET est bien le roi des séquenceurs. Que ce soit avec des suites de sons où la ligne mélodique est directement perceptible, avec des structures plus froides et synthétiques, ou enfin avec des passages complètement expérimentaux, ils sont la marque de fabrique de notre Ibère. L’auditeur pensera immédiatement à Klaus Schulze ou à Ashra, même si c’est à Peter Baumann que Lakveet fait un discret hommage. A l’instar des fractales qui ornent le livret, Lakveet nous offre un album d’une précision mathématique mais pas pour autant dénué d’une certaine poésie, même si certaines ambiances sont presque dark.